Coordinators: Gore Mohini, Jagtap Umesh B. This volume details methods and techniques for identification of drug targets, binding sites prediction, high-throughput virtual screening,and prediction of pharmacokinetic properties using computer based methodologies. 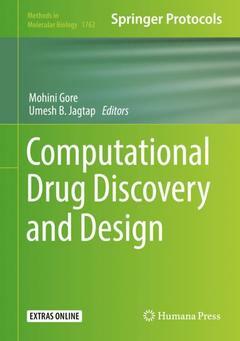 Chapters guide readers through techniques of the available computational tools, developing prediction models for drug target prediction and de novo design of ligands, structure based drug designing, fragment-based drug designing, molecular docking, and scoring functions for assessing protein-ligand docking protocols. Written in the highly successful Methods in Molecular Biology series format, chapters include introductions to their respective topics, lists of the necessary materials, step-by-step, readily reproducible protocols, and tips on troubleshooting and avoiding known pitfalls. Authoritative and cutting-edge, Computational Drug Discovery and Design aims to provide protocols for the use of bioinformatics tools in drug discovery and design.